Update: Looks like resellers were a bit gung-ho about Haswell coming in this Acer AIO. CNET provided an update Friday that the chip inside the device is actually a Texas Instruments OMAP 4430 dual-core ARM Coretex-A9 processor, a longer though more accurate name for the silicon inside. The DA220HQL apparently comes with a 21.5-inch multi-touch display and a resolution of 1920 x 1080. 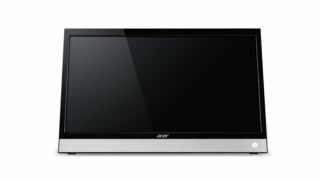 Acer's upcoming all-in-one (AIO) PC has turned its nose up at Windows 8.1 in favour of Android OS, and we're expecting to see it land next week. The Android PC retail for around a surprisingly low $400 (£262, $416 AUS). At this price, the AIO will be significantly cheaper than other home PCs on the market that are running Windows 8, which could attract buyers who aren't looking to do any serious computing tasks. The low price does come at another cost, however. The AIO will include only 1GB of memory and storage options are expected to begin at 8GB. These lows specifications put the PC in the realm of big-screen tablets that are aimed at people who mostly browse the internet. It's likely that Acer and others will create rival PCs that include Intel's cost-effective Haswell and Bay Trial processors.